Cut hazards are extremely dangerous, and can be more so when they're placed in slippery environments. 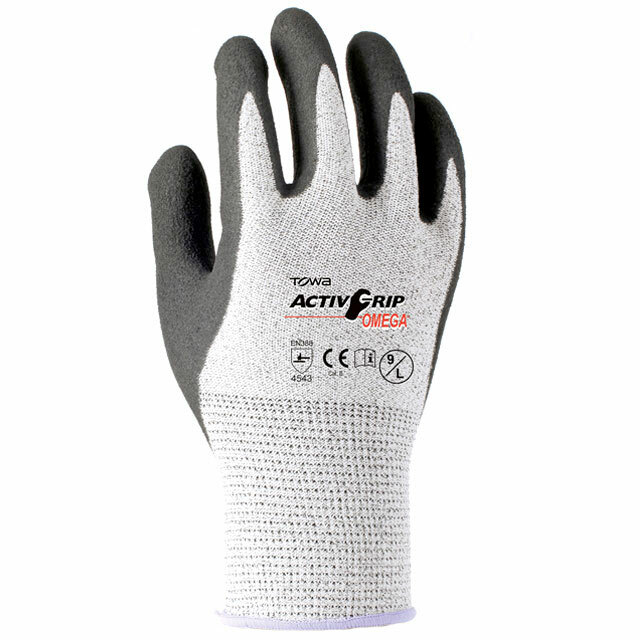 The Towa ActivGrip Omega Liquid Resistant 540 Gloves feature a nitrile coating for ultimate grip in wet, oily and dry environments. The gloves also offer the highest level of cut resistance, making them ideal for handling in wet and dry conditions where cut hazards may also be present. These gloves are designated Category II gloves, meaning they should be suitable for most medium-weight tasks. The gloves are highly resistant to mechanical risks and are made to be used in wet, dry or oily conditions. This makes them ideal for wet or oily handling tasks where physical hazards are involved. The Liquid Resistant 540 Gloves are available in five sizes to fit most hands. Please measure the circumference of your hand around the knuckles (excluding your thumb) with your palm open and your fingers together. Next, measure the length of your hand from the tip of your middle finger to your wrist.